can you explain how you did this? i have all the parts on hand except the relay, and i'd like get this built. thanks! why source out a single pole and a relay when you can do it this way right? 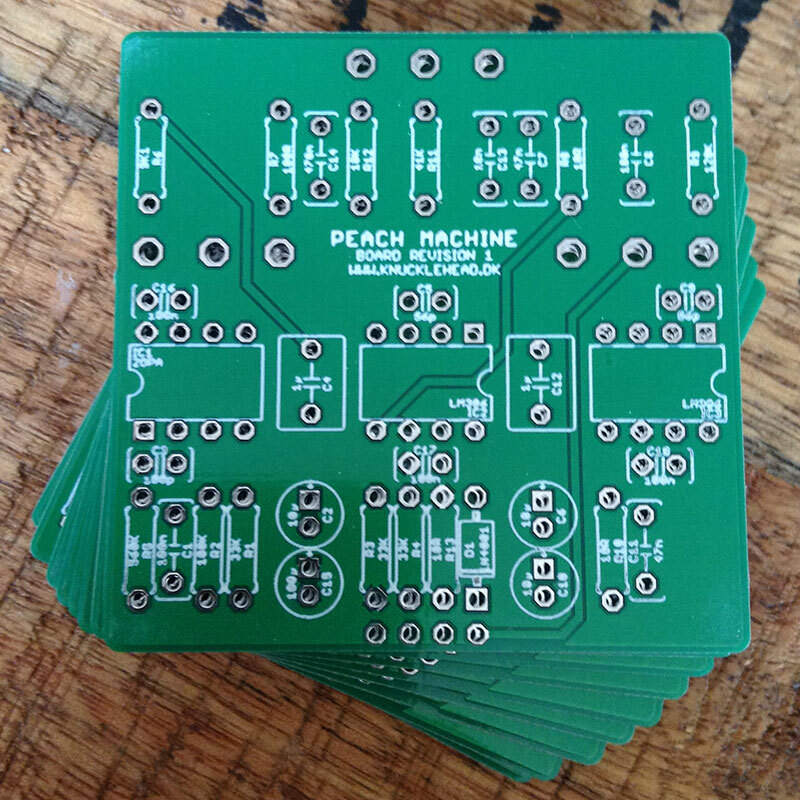 It seems that the last, most recent schematic for the Peach Fuzz has gone missing (the link is no good anymore). Does anyone have a final schematic for posting? Or can someone email it to me so I can post it? Guys, what do you think about idea to replace original tone control and build Peach Fuzz with Timmy Bass/Treble control? I had Peach Fuzz and liked it, but sometimes low end was too big and woofy. I used Snail's layout and I'm getting a little bit of motorboating with mine. It is in the same case as a SHO, and only happens intermittently when both effects are engaged. I tried moving all the wires and boards around but nothing gets rid of it. I put a 220uf across the power supply, as well as a 47ohm resistor in series with the 9v to each effect and it tamed it down, but didn't kill it. Anyone else have this problem and figure out how to fix it? it took me ages to stumble across that thread so I thought i would post a link here, too, as well. interesting fuzzstortion... kind of sounds like a metal zone or metal muff or something... real crisp and dry sounding, not all phat and juicy and whatnot. Someone made a T Rex (The Slider) comparison and I think that's a good one. I like the "voice" of this circuit, it's got a muffy low end and a certain vocal quality that I always search for and am happy to find in a fuzz distortion or overdrive...it's unique. Don't know if this will be a go-to for me but I'm glad I built it. The Sonic Titan is another really great LM386 distortion device. I also really like the Penny Pedals Fingerprint a whole lot another based on a similar chip. I recently built this one for a friend. Sounds pretty good. Hmm. 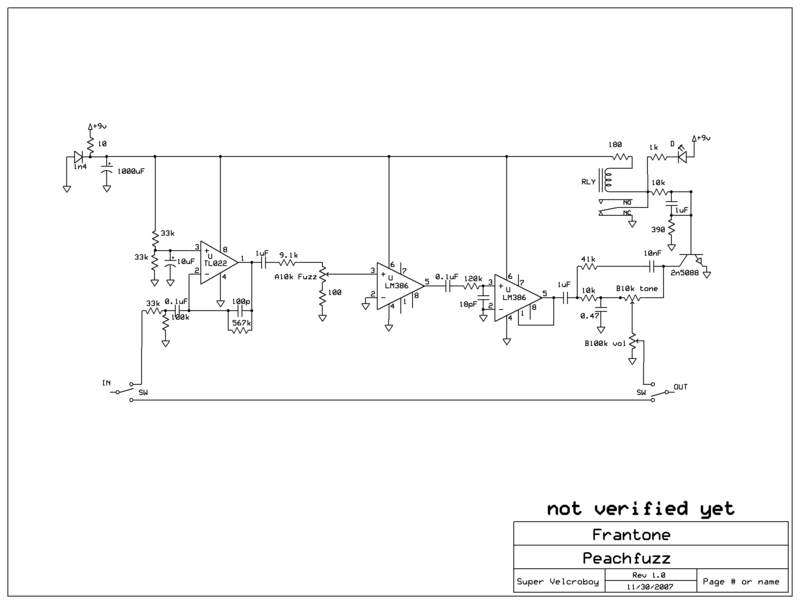 The unused opamp channel could be used as inverting recovery after the tone stack. It would not need much gain, if any. mirosol wrote: Hmm. The unused opamp channel could be used as inverting recovery after the tone stack. It would not need much gain, if any. The output signal is being clipped by the LM386 and is rather close to the supply rails. I have a stack of spare boards left after building the two i needed. The first dual opamp is NOT a TL022, it is definately a TLC (rail to rail opamp) NOT TLO, from the photos posted earlier in this thread. My guess is it is a TLC2262 device. There are 3 different types of LM386N power opamps: The LM386N-1, which is the one used in the Peach fuzz is a 6 volt device. The others are LM386N-3 whch is a 9 volt device and the LM386N-4 which is a 16 volt device. Sorry to resurrect an old thread, but I just wanted to comment that your guess is correct !! I bought a Peach Fuzz reissue, took a few pictures and traced the board completely.